In the mid-19th Century, a doctor noticed something unusual about a group of Polish miners: they seemed to be in strangely good health. After all, most 19th-century miners worked in poor conditions for long hours, and were prone to respiratory ailments like bronchitis and silicosis. Even in Europe’s most industrialized nation of the era, the U.K., mine workers were lucky to see their 40th birthday. So what made the Polish miners different? As the story goes, Dr. Feliks Boczkowski examined the healthy miners, and came to a startling conclusion: the mines themselves may have been providing some health benefits to the workers. Specifically, Boczkowski looked at workers at Wieliczka, which was one of the world’s most important salt mines at the time. He concluded the salty air in the tunnels had respiratory benefits, and kept the miners in better shape than other industrial workers. Boczkowski is typically credited with founding the world’s first salt therapy clinic somewhere around the mid-19th century, and was purportedly quite successful. Since then, salt therapy — or halotherapy — has spread throughout the world. While the science is unclear, plenty of patients swear by the health benefits of halotherapy, especially when it comes to clearing up the symptoms of respiratory problems. Starting with something uncontroversial, it’s pretty indisputable that sitting in a salt cave can be surprisingly good for the mind. Most halotherapy clinics are based around a (natural or artificial) cave, or room packed with natural rock salt. Himalayan salt is usually the preferred option nowadays, due to its purportedly high mineral content. The cave is then pumped with salty air. For advocates of the treatment, this salty air is the linchpin of the whole experience; the inhalation of salty air is supposedly the main, active healing mechanism in halotherapy. Basically, you’re being inundated from all sides with salt, salt and more salt. Coming out, you’ll probably feel refreshed, not to mention weirdly clean. For me, the best comparison is going to the beach. If you’ve ever gone to the beach with blocked sinuses, then you’ll know that feeling of coming home with a fresh, clear head. Leaving a salt cave feels pretty similar, except that your entire body feels scrubbed clean and rejuvenated. To see what you’re in for, check out these impressive images of some beautiful salt caves around the world. Moving on to halotherapy’s biggest claim to fame, advocates argue the treatment can aid people suffering from common respiratory problems. Advocates point to everything from chronic bronchitis to asthma as potentially being treated with halotherapy. The science, however, isn’t particularly good. Studies on the effectiveness of halotherapy in aiding in recovery from respiratory ailments have all-too-often found little to no measurable evidence of patient improvement. Having said that, experts say there’s likewise no evidence salt therapy can do any serious harm. While the science is pretty murky on whether salt caves can actually improve health, plenty of patients say the treatment at least makes them feel a lot better. Take this study, which looked at whether halotherapy could improve pulmonary function. While the study itself found no evidence of clear health benefits, the majority of participants nonetheless said they felt “satisfied with halotherapy and requested to receive the medication again.” So even if halotherapy can’t cure the underlying condition, it might be able to bring your symptoms under control, and allow to you get on with your life. While there’s little to no evidence halotherapy can cure most common respiratory ailments, there is some good news for smokers. A 2006 study found aerosolized salt (like the salty air in salt caves) can temporarily but noticeably improve breathing for smokers. Patients reported significantly lower levels of coughing and mucus production. So if you’re a smoker or ex-smoker with respiratory problems, you should totally try a salt save. What do you think? If you’ve had an experience with halotherapy, let us know how it went in the comments below! 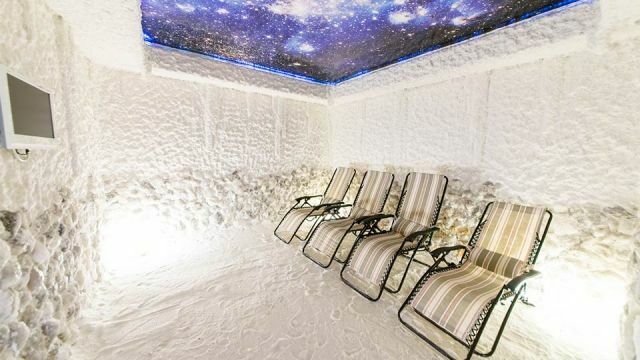 Hey Buddy!, I found this information for you: "3 Reasons To Go Sit In A Salt Cave Right Now". Here is the website link: https://www.thealternativedaily.com/3-reasons-to-go-sit-in-a-salt-cave-right-now/. Thank you.